One thing that frequently makes me cringe is the sheer amount of waste us humans—especially those in the western world—produce. Most of the time, the reminders are subtle, but once in awhile they go beyond the threshold of the utterly absurd. For example, there was the time I mail-ordered some valve seals (o-rings), two rubber grommets, a decal sticker, and an air injection manifold for the MGB, and ended up receiving a box the size of a microwave that contained mostly styrofoam and plastic. Or when I went into OfficeMax to purchase a copy of TurboTax (this was many years ago, before I started boycotting Intuit and began using TaxAct online), and came home with packaging the size of a cereal box containing acres of plastic encasing a single CD-ROM. I further reflected of our society’s wastefulness when, at a recent Spanish Conversation Meeting, my friend James presented a slideshow of his recent visit to Cuba (yes, he was able to get in despite the U.S.’ embargo) and related how in contrast to Americans, Cubans save and reuse everything—including plastic bags (that they’d even wash and hang dry) to bring to the grocery store. Now, I have been much better in the last half-year about my consumption of plastic bags, especially since I bring my own canvas bags to go grocery shopping. I even reuse (by saving and bringing into the grocery store) those clear plastic produce bags for fruit and bulk items. In the case of bulk items, I also save the twisty tags (with the product code written on them) with the bags, so that I use the same bag I’ve always used for, say, raw cashews to prevent cross-contamination of food. Still, like most Americans, I’ve made rather significant contribution to the landfills. So the last few months I’ve been trying to reduce my impact. Here is the latest results. See the photo above. That single black trash bag is how much I’ve contributed to the local landfill from October 3rd-February 7th, or the last four months. Yes, four months! It would have been less if I didn’t have to replace the rear muffler on the Alfa Romeo (it fell off on the way to Eldora Ski Resort—whoops!) The pipe sticking out of the bag is part of the muffler. Recycle as much as possible. 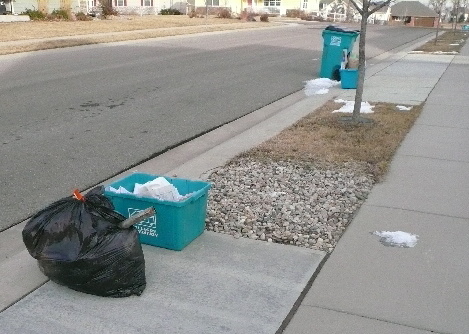 Fortunately, my trash pickup service (as mandated by Fort Collins) makes this easy with curbside recycling. They accept paper, metal cans, most plastic containers (although they can only recycle #1 and #2 plastics), cardboard, and aluminum foil. One can just throw all these items in one recycling bin without sorting. For plastic bags, I save them all and bring them into Albertsons for recycling. Purchase a minimum of processed foods. Processed foods usually come in a lot of wasteful packaging. They are also less healthy. For organic waste such as orange peels, vegetable fragments, egg shells, etc., I use the garbage disposal. Supposedly, these waste products will be converted into fertilizer by the sewage companies. A plus side of this is that by staying out of the trash, they don’t stink it up. Happily, Fort Collins not only encourages minimizing trash, but rewards it as well. They’ve mandated that the trash pickup companies offer tiered pickup plans based on how much trash one generates. Hence, those who generate less waste can also save money. In my case, I used to subscribe to the smallest trash bin plan, in which for $8.55/month, I’d set out a 35-gallon trash bin each week and they’d pick up the trash contained within it. Since October 3rd, however, I’ve subscribed to their bag-and-tag system. This costs $4/month + $1.35/bag. Since I’ve only generated one bag of trash in the last four months, I’ve saved 4*($8.55-$4) – $1.35 = $16.85 since the beginning of October. Ok, that amount of money saved is rather trivial. But, my motivation is not so much to save dollars but to reduce impact on the environment. Trash in landfills take a long time to degrade and yet a lot of toxins leach out of the nasties like plastic and contaminate the groundwater. The more waste one produces also suggests he is needlessly using more resources—such as energy and petroleum used in the manufacture of many of the wasted goods. My next step is to start composting instead of dumping organic waste down the garbage disposal. This will help out with my garden as well!